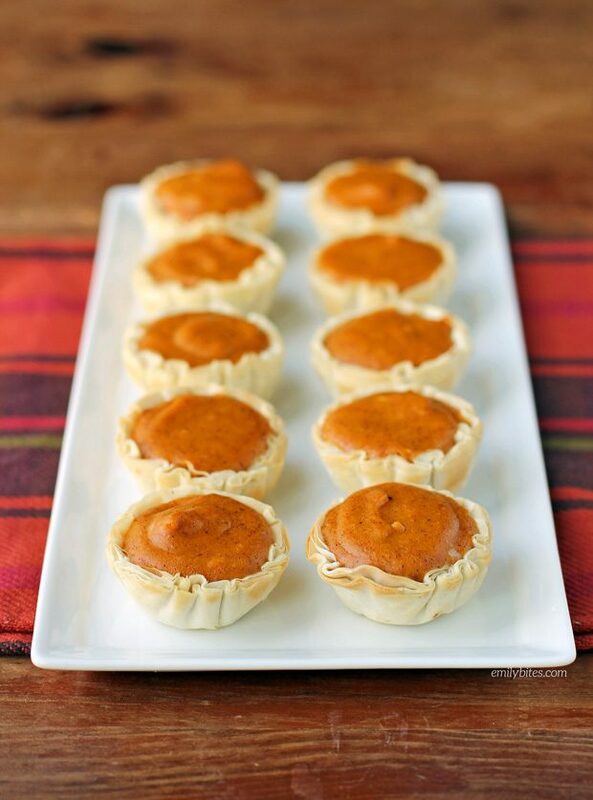 If you are looking for an easy, lightened up dish to bring to your Thanksgiving or Friendsgiving celebration, look no further than these Pumpkin Pie Bites! 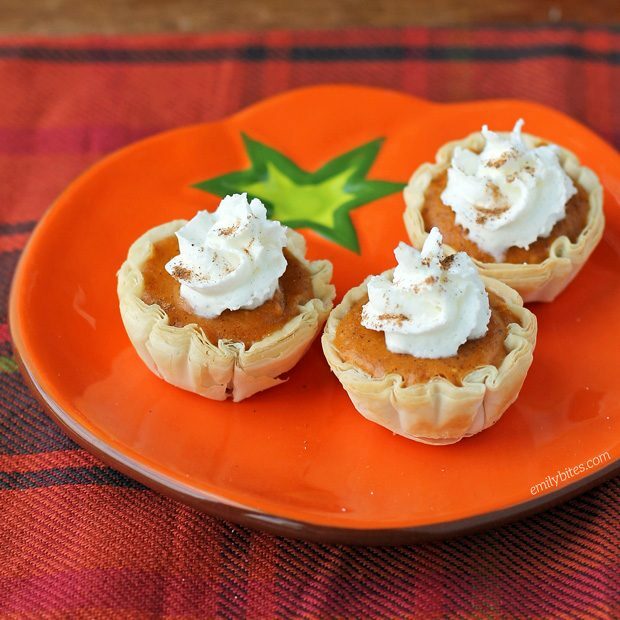 These mini pumpkin tarts are the perfect way to savor the flavor of your favorite dessert without adding a lot of calories to your holiday meal. 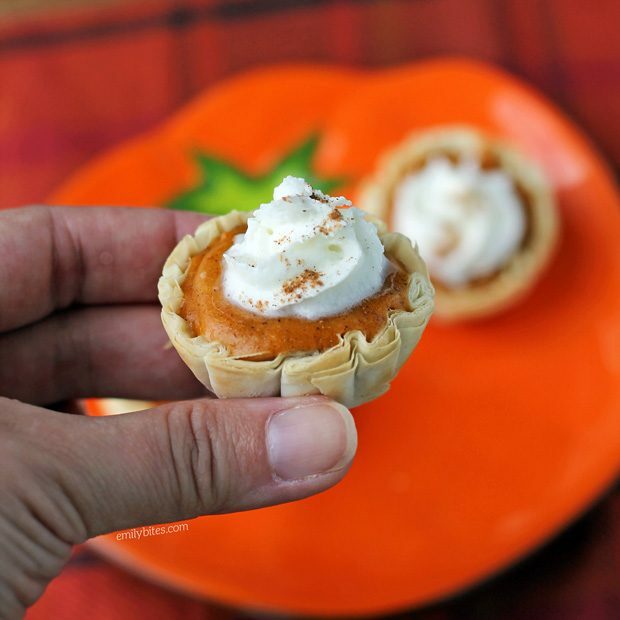 You will love how fast and easy it is to make these Pumpkin Pie Bites (so much quicker than a full-sized pie) and your friends and family will love the sweetly seasoned pumpkin pie filling and the crispy phyllo shell. Each of these mini pies is just 44 calories or 2 Weight Watchers SmartPoints and even if you fill up on turkey or stuffing, you’ll definitely be able to make a little room for one of these. They’re worth it! I suggest making these Pumpkin Pie Bites the day you plan on serving them, which is easy since they come together (including bake time) in about 20 minutes (or less). If you leave the leftovers in the fridge for longer than a day the phyllo shells get soft and they lose the crispy texture. If you’re making them for yourself at home and only planning to eat a few at a time, there’s an easy solution for this! Just make the filling and only fill and bake a few at a time. Refrigerate the leftover filling until you want more. The cream cheese in these makes them really rich and thick and creamy but you can’t taste it, so don’t worry if you aren’t a cheesecake fan – the flavor here is all pumpkin. More of an apple pie or pecan pie lover? I have easy mini versions of those as well! Check out my Mini Cinnamon Apple Tarts and Pecan Pie Bites. In a mixing bowl, combine the cream cheese and sugar and beat with a hand mixer until smooth. Add the egg white and beat again until combined. Add the pumpkin, vanilla and pumpkin pie spice and beat again until well combined. Spoon the pumpkin mixture evenly into the phyllo shells and place the baking sheet in the oven. Bake for 12-15 minutes until the edges of the shells start to turn golden and the filling is heated through. These look amazing! I think my kids would love them as a yummy fall snack. I have full size phyllo sheets in my freezer I would like to use up – I plan to cut to size. How many layers of the sheets are used with each pie? Hi Deserai! I’m honestly not sure, I just buy the little pre-made phyllo cups and I’ve never counted the layers or made these from the full sheets. I’m sure you can probably wing it, I hope it turns out great! These are delicious!!! I made them a week ago to bring to a get together. Perfect little treat and absolutely delicious. I plan on making again for Thanksgiving. I used 15 shells and still have lots of filling left. How do I figure points? Shells were full to the top and I can probably make 15 more! Hi Jolene, if you have extra filling and want to make more of them you’ll have to run it through the recipe builder! Mine were super full but I got 15. Can these sit out? Id like to make them in the morning before dinner. I have the same question for the apple tarts too. Could you substitute the pumpkin for sweet potato? Can you use Splenda or a stevia-type sweetener instead of “real” sugar? Thatshoild reduce the points, no? I’ve never tried it but probably! Can you use brown sugar instead of white? If so how much?